← Voices of Transition #3: A transition journey…. This week a conversation from almost a decade ago popped into my mind. In it I was speaking with a brainy friend of mine who was a coder at Microsoft. He and I were talking about how small teams of coders were independent but highly linked. For example, one team might be given the challenge to build the “slide show” function for Powerpoint; another might be given the “inserting pictures” function. Each group would work on their own piece. Every night they would run a routine to integrate all of the code written that day by the various teams. Sound groundbreaking? Not exactly. Before this approach most engineering departments would let engineers write until their sub-problem was ‘solved.’ Once everyone finished…they would attempt to put it all together. This usually meant lists of re-do’s and work-arounds that required months, if not years, of fixes. By the late 90’s Microsoft and many others had learned that using a daily trial integration allowed for great efficiency and great outcomes. So how on earth did I remember this obscure conversation? I stumbled upon an online tool for crafting personal elevator pitches this week. It was really remarkable. The tool is super easy to use and really challenged me to write down in words the tremendous swirl of activities that currently consume my professional life. In short I made more progress playing with this tool for 15 minutes than I had in ruminating these topics over the past six months. Trial integration? How does it all fit together? I’m all for it. Check it out, the Elevator Pitch Builder. Please don’t be put off by its business-y bent. It can be used for personal objectives as well as for the pitch to promote a swanky new company. I wonder where I would get to if I used the tool 15 minutes everyday for a week. Are you game to give it a try? While I was making big progress on articulating my focus I happened to grab the book, The Miracle Chase, by Joan Louise Hill, Katie Mahon, and Mary Beth Phillips. It had been referenced at the MA Conference for Women in December. The title alone piqued my interest. The book is a re-telling of a ten-year journey by three women who seek to validate the concept of miracles. Not sure where you sit on the spiritual spectrum but these ladies embraced it after a barrage of issues that came their way: a child’s disability; cancer; divorce; major family illness; and close encounters with near death situations. This latter one got my attention: one of the authors, Katie, had a risky encounter with a person whom she’d later learn was Ted Bundy. The ladies got close to embracing my Microsoft-esque trial approach in writing about miracles. Over their ten-year quest they created trial definitions for a ‘miracle’ only to refine them as their knowledge base expanded. The time sequence was off but the approach was still valid. This trial approach reminded me of Herminia Ibarra’s view of experimentation in her book, Working Identity. Remember that one? Ibarra encourages folks to craft experiments that we can learn from… all along the way to making significant changes in our lives. 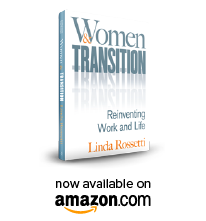 I am still trying to develop a solid definition for women’s transition. I think there is something to Microsoft’s engineering approach to rapid trial. Truth be told when I was working at my C-suite job I couldn’t have found the bandwidth to use a trial tool for 5 minutes in a year — let alone for 15 minutes each day for a week. I would have scoffed at the idea and kept right on going. The view from my seat now is that the unrelenting pace and the demands on me as a parent and professional warped my judgment. I could have used the 15 minutes of thought. Can you? The ladies in the Miracle Chase never really conclude the presence or absence of miracles. They do however reach a plateau of sorts filled with a grace that seems to evolve from their miracle expedition. While I’m not sure if grace will flow from the quirky elevator pitch tool, I am certain that it will reap benefits for you that far exceed the time invested. Go ahead, give it a try. This entry was posted in Observations on Transition and tagged career transition, elevator pitch, Miracle Chase, observations from a women's transition, Personal Elevator Pitch, trial integration, women's transition, women's transition issues. Bookmark the permalink.